First login, then click on the newsletter tab and click the newsletter you want. Old newsletters are kept in zip files. We find printing on your own is helpful to process so many details. What is the publishing schedule for the newsletter? The newsletter is published for 10 months, from August to May. Deadline for submissions to the newsletter is the 20th of the month prior to publication. Where do I find more information from the state? (This includes opening your homeschool, logging into your NCDNPE account, forgetting your number or additional info). 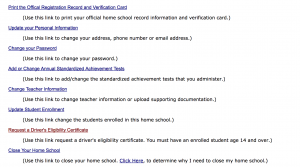 What is available when I log into a homeschool account with the state? 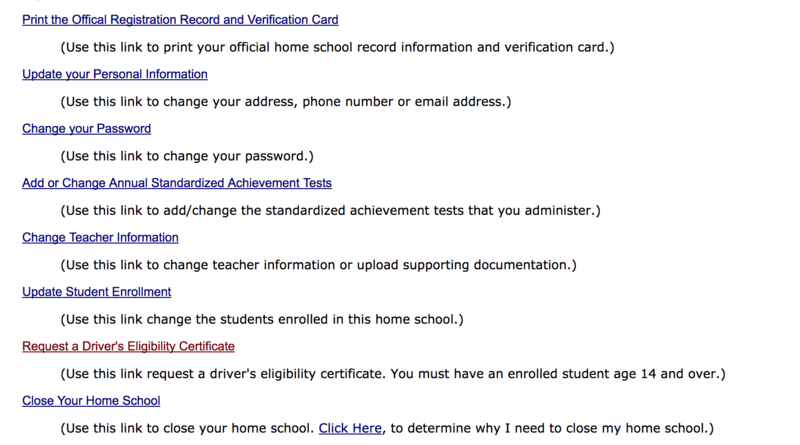 These are the options that can be accessed through your account. I’m a coach or have sports information I want on the site. Who do I contact? Please send an email with the information to sports@ncfhe.org . I’m looking for information on sports options or a specific sport? Please see http://sports.bluesombrero.com/fhe-sports (or click on “Athletics” under www.ncfhe.org which will take you to the bluesombrero site) for ALL updated sports information. Coaches/managers per sport are under CONTACTS and are sorted by season. The tab marked UPCOMING SPORTS contains all the latest information regarding meetings, signups and tryouts. Can you homeschool my child? Homeschooling, by definition, is the education of children at home by their parents. I am pulling my child out of public school. Can you recommend someone to homeschool my child? Thank you for contacting FHE. We are a support group that provides workshops, speakers, events, socials, and other resources to assist homeschool families in their journey. While membership to FHE does provide members with a resource list of co-ops, classes, and tutors available to the local homeschool community, we cannot recommend individuals to homeschool your student exclusively. See the above question about the definition of a homeschool. It is permissible for another family to educate another child or children from one other unrelated family under their homeschool. Since you have felt led to remove your child from the public school, perhaps you can let your need be made known through your local church, or through individuals you know who currently homeschool. I have elementary/ middle school/ high school age students. What do you offer for this age child? We offer a variety of social activities, enrichment events, and service projects as well as connections with local co-ops which offer a wide range of middle and high school classes. Our Time-out group plans field trips and activities for elementary age children several times a year and our teen/tween group does monthly activities as well. We provide a graduation and prom for your high school students. Please see our newsletter or calendar for activities occurring this month. Do you offer classes for K-6 students? We are an area homeschool support group, and as such, we don’t offer classes. Many homeschoolers feel that kindergarten is too young to start formal classwork for education, and that the home is the best environment to begin academics. In fact, it is very reasonable to expect to spend about 30 minutes a day doing actual academic work with a kindergartener (letters, phonics, beginning math work, and handwriting). The majority of time would be spent with hands on, active learning, reading out loud and active play. A good book about early learning is Better Late Than Early, by Raymond Moore. One advantage to joining FHE for you would be all of the outside activities you would be informed of in our newsletter. We have a monthly ‘Time Out’ group that meets with families of young children, field trips, art classes, PE classes and other activities that might interest you and your daughter. Please see our resource list for more information on classes, co-ops, etc. I am a teacher and want to get plugged into the homeschool community. Can you help me? Please send your information to newsletter@ncfhe.org by the 20th of the month and our newsletter editor will try to include it in the next issue. Advertising charges may apply in some cases. I need to add another child to my homeschool. Do I need to file anything with NCDNPE? Or call (919)733-4276 for more information.